First, it is angina. Angina (an-JI-nuh or AN-juh-nuh) is chest pain or discomfort that occurs if an area of your heart muscle doesn't get enough oxygen-rich blood. Angina can be described as a discomfort, heaviness, pressure, aching, burning, fullness, squeezing, or painful feeling due to coronary heart disease. Often, it can be mistaken for indigestion. Angina is usually felt in the chest, but may also be felt in the shoulders, arms, neck, throat, jaw, or back. Prinzmetal's Angina is found in all age groups, both sexes and people of various states of physical condition. It has some insidious differences from the more common forms of angina. 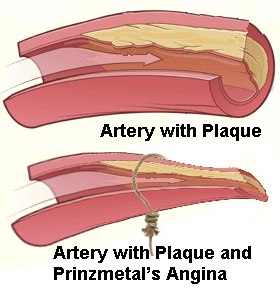 Prinzmetal's angina may also be referred to as: Variant angina, Prinzmetal's variant angina or Angina inversa. CHD is the most common type of heart disease in adults. It occurs if a waxy substance called plaque (plak) builds up on the inner walls of your coronary arteries. These arteries carry oxygen-rich blood to your heart. The build-up of plaque reduces the volume of blood that can pass through the artery, starving the heart muscle and causing the pain. Prinzmetal's Angina is the name given for the disease in which the supply of blood to the heart is reduced by a spasm in the coronary arteries which supply blood to the heart muscle. When this occurs, the patient feels the same kind of pain as in other forms of angina. Here is where the major problem for sufferers of Prinzmetal's Angina becomes obvious. It is the reason why so many sufferers go undiagnosed or misdiagnosed. Of the two illustrations of an artery, the normal artery (image on the top) is what the artery of a patient looks like before and after an attack. It only looks like the illustration of a coronary artery spasm (image on the bottom) during an attack. If you get an examination by a cardiologist to assess your health there is nothing for him to see that would indicate that you have PA. Your arteries look normal. If you have an angina attack and then go to your cardiologist to report it, there is nothing for him to see that would indicate that you have PA. Your artery would be back to normal. The only way for him to actually see that you have PA would be if you have an attack while you are in his office and he can use his diagnostic equipment while the spasm is occurring. Luckily for PA sufferers that has happened enough times for it have been noted. What commonly happens is a patient who suffers repeated angina attacks over a period of time is given a cardiac angiogram to let the cardiologist see what is in the artery that might be causing the attacks. He expects to see a build-up of plaque. If he sees that, his diagnosis becomes simply, CHD (coronary heart disease) which is taken to be caused by the plaque that reduces the flow of blood to the heart. If he doesn't find plaque he has nothing to use from which to make a diagnosis. If he has been following your attacks for a period of time and none of your tests have been positive for anything he is looking for, he may say something like, "We've ruled everything else out. The only thing left is Prinzmetal's Angina." That is, if he is a knowledgeable cardiologist. Unfortunately, a great number of cardiologists are complete ly unfamiliar with the disease because they have never seen it or more probably they didn't recognize it when they did see it. Plaque buildup is common enough for your angiogram to show its presence. Your cardiologist will naturally assume that was the cause of your angina. He has no way to know if you also have PA because there are no visible signs. Your plaque may have had nothing to do directly with your angina attack. It could have been due to PA. But, if you have a PA constriction of your artery and you also have a plaque buildup you can readily see that the attack will be much more serious with both factors adding to the reduction in the flow of blood. Another problem is that the cardiologist will see the amount of plaque in your artery and assess your level of risk based on the amount plaque. He doesn't know that you also have PA. It is possible that a PA incident in clean arteries would be only a painful temporary event, or that the amount of plaque you have would only be a warning to start controlling your cholesterol. But a PA event in an artery already partially blocked by plaque could be fatal. That fatality would never be attributed to PA because after death, the muscle spasm would be released and never found. We have no idea how many people die each year from Prinzmetal's Angina. Unlike typical angina – which is often triggered by exertion or emotional stress - Prinzmetal’s angina almost always occurs when a person is at rest. These attacks can be very painful. Cocaine use and others we have not idea about. Medicines can help control the spasms. Drugs such as calcium antagonists and nitrates are the mainstays of treatment. Prinzmetal's angina is a chronic condition that will need to be followed by your health care provider even though the prognosis is generally good. A donation to APAA is tax deductible.